Watkins Glen still rules after all these years, and this weekend, the WeatherTech Sports Car Championship ran its phenomenal 6 Hours of the Glen there. There’s nothing like bombarding the peaceful hills of upstate New York with the roar of multi-class sportscar racing. Risi Competizione driver Toni Vilander discussing the car after qualifying. Hopefully you caught the action from the Glen, which ended with the No. 5 Action Express Racing Corvette Daytona Prototype winning by a microscopic 0.709-second margin over its teammate No. 31 car for the overall win. 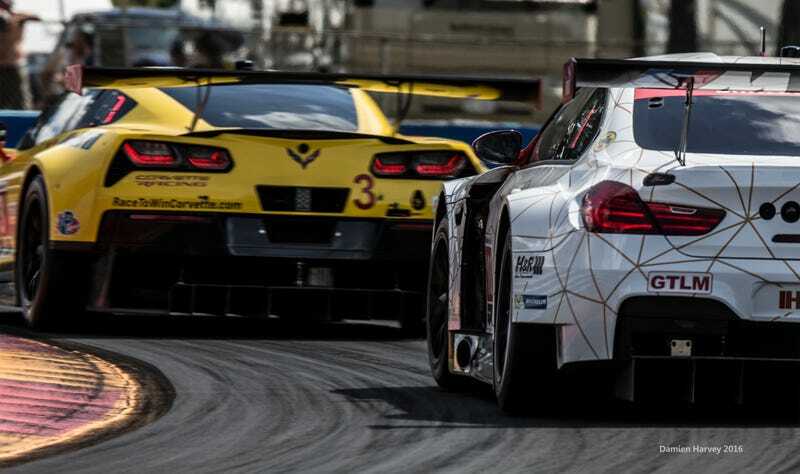 In case you missed it, the entire race is now live on imsa.tv—but we’ve also got some lovely glamor shots from the race here as well from photographer Damien Harvey. Harvey is based in D.C., has worked with us before, and he was on site to capture some of the weekend’s action. Enjoy! Tom Long inside the No. 70 Mazda Prototype, concentrating before qualifying. Joey Hand, driver of the No. 66 Ford GT, which came in second place. Tom Long inside the No. 70 Mazda Prototype. No. 70 Mazda Prototype driver Ben Devlin. Dane Cameron exits the No. 31 Action Express Corvette Daytona Prototype during a driver change. Ozz Negri inside the No. 60 Michael Shank Racing Honda Ligier JS P2. Mikhail Goikhberg in the No. 85 JDC-Miller Motorsports Prototype Challenge car. Tristan Nunez inside the No. 55 Mazda Prototype. Richard Westbrook, driver of the No. 67 Ford GT that won the GTLM class from pole position. Scuderia Corsa driver Christina Nielsen, after qualifying. One of the Ferrari team members anxious during qualifying. Photographers camped out at a corner. All photos credit Damien Harvey.